doctor of technical Sciences, ProfessorDepartment of BMaT. Leading teacher of the course “Construction mechanics”, “Calculation and design of building structures” “Design of buildings and structures”, “engineering safety of structures, risk assessment and study of the reliability of building structures”. Head of master’s theses.Author of more than 200 scientific works, including 2 monographs, 3 textbooks for technical higher education institutions, 70 state normative and technical documents (SNiP, SN, SP, RDS, NTP to Eurocodes), 17 patents for invention, 20 special technical conditions for the design and construction of high-rise and technically complex buildings. 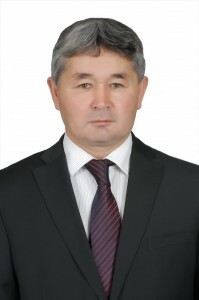 Director of research, experimental and design and survey Kazakhstan multidisciplinary Institute of reconstruction and development. (Kazmir) at the University. Scientific supervisor of more than 700 research works, more than 1000 implemented working projects on new construction, reconstruction and restoration of buildings and structures. He was awarded three state awards, as well as badges: “Honored worker of science of the Republic of Kazakhstan”, “Honorary worker of education of the Republic of Kazakhstan”, “Honorary Builder of the Republic of Kazakhstan”.